Good morning. 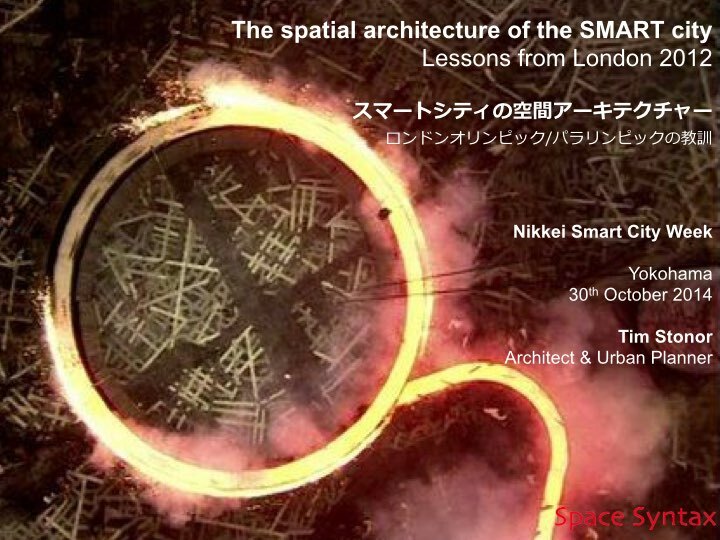 It is a pleasure and an honour to have been invited to give this presentation today at the Nikkei Smart City Week conference. The subject of my talk is architecture – not only the architecture of buildings but, also, the architecture of public space: the space that we move through and live our lives in; the glue that binds us together. First, what is a Smart City? Second, how can a Smart City be planned & governed? 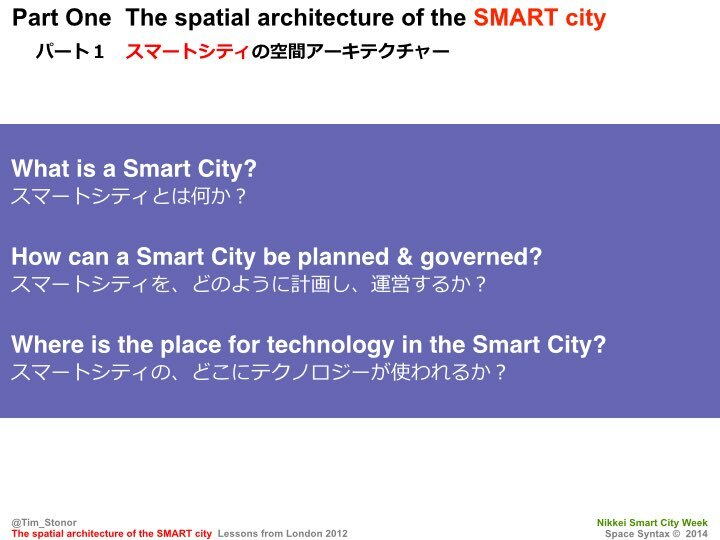 Third, where is the place for technology in the Smart City? And I will relate each of these questions to the architecture of space. 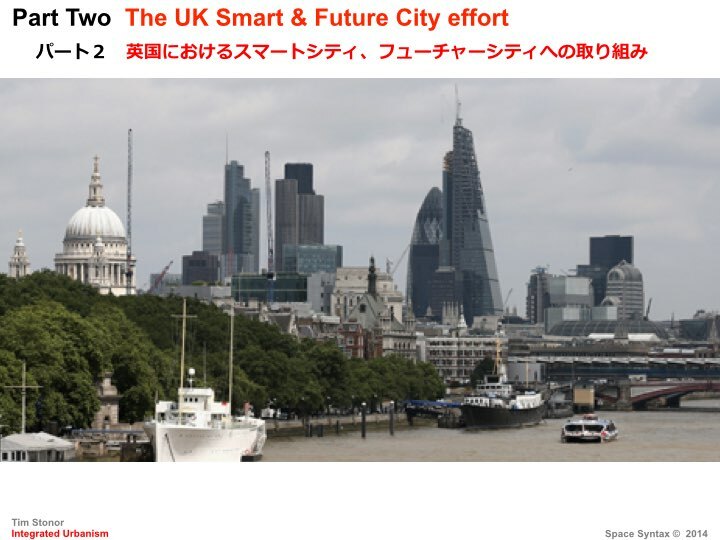 In the second part of my presentation I will describe the very significant effort that the UK is making to plan for its urban future, embracing the opportunities that new technologies provide. I prefer the term “Smarter City” to “Smart City” even if it has already been claimed by IBM. 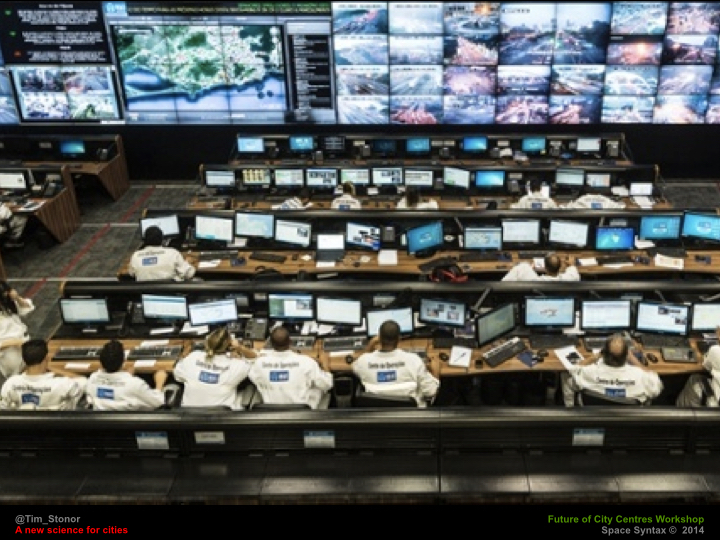 “Smarter City” suggests the city is already smart and technology can make it smarter, whereas “Smart City” can be misinterpreted as suggesting that the city is dumb and technology, like a White Knight, will ride to its rescue. And in truth some cities are dumb – or have been made dumb by modern transport planning: choked with congestion in pursuit of car-based sprawl. But not all cities are dumb. We have cities for a reason. They are fundamentally smart in the way they create intensification of opportunities for people to meet, interact and transact. In this sense, cities are a natural product of human evolution. To be truly smart, cities need to recognise their fundamental smartness. Real cities – the places that resonate to the “urban buzz” – are already smart cities. Historic cities, unsullied by destructive modern planning, are smart cities. Low technology cities, if they are compact and people-focused, are already smart cities. Future cities need to be as smart as great historic and low technology cities. Smart as Cities – best! A talk given to the Leaders and Chief Executives of the Key Cities, Brighton, 24th October 2014. We hear a lot about smart cities as the solution to the needs of urban places. But although technology allows us to live remotely and speak to each other from deep forests and mountaintops, humanity as a species has become more and more urban. The more that we could be apart, the more we have actually come together. Notes of Bill Hilliers opening talk about the NLA Smarter London exhibition, 8th October 2014. Congratulations to the NLA and CASA for the exhibition. It’s evidence that London is the original smart city – nowhere such a collection of top class practices, imaginative authorities and academic departments developing new ways of doing things, and new technologies –and talking to each other ! 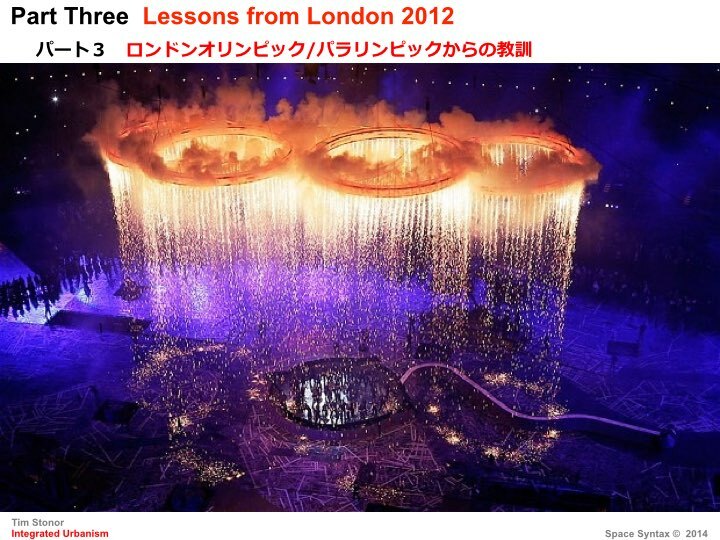 But I think London is a smart city also in another sense – the city itself and how it’s put together. When I was young London was regarded as an unplanned mess, in need of being tidied up into a system of well-defined neighbourhood units separated by main roads – a bit like Milton Keynes. I’ve been asked to say something about one of the technologies on show – space syntax. “Cul de sac layouts may be the opium of the unwary – seemingly an analgesic against high-density urbanism – but beware the risks of over-indulgence”. “Build cul de sacs because that’s how people want to live”.